2. Then, wait for the import to complete. 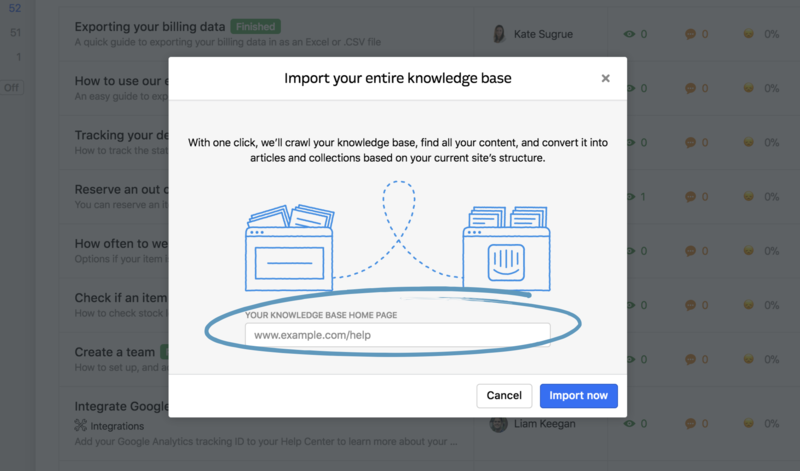 During this time we’ll crawl your docs site, import articles, and place them in collections that match the structure of your existing knowledge base. 3. Refresh the page to see your imported articles and collections. 4. Finally, turn your Help Center on and your articles will be live. Important: If you haven't already, you’ll need to start a trial of Articles or your articles won’t go live. What happens to uncategorized content? If you have any uncategorized content on your site, Articles will automatically create a ‘General’ collection for you. 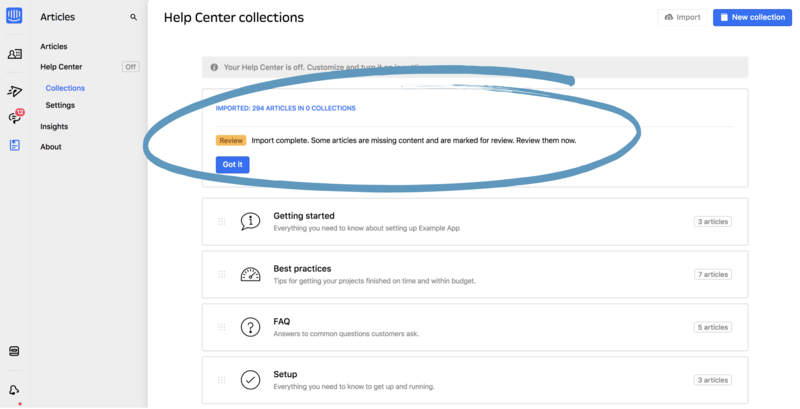 Collections help your users browse and easily find what they need, so consider reorganizing these articles by topic before you publish them. Tables (you can always take a screenshot of your table and add it as an image). Nested lists (you should reformat this as a single-level list or take a screenshot). Video hosted on an unsupported provider (we only support YouTube, Vimeo, and Wistia, so you’d need to upload the video to one of those sites and then embed it). Important: We only import publicly published content. Importing from category/collection URL's also isn't supported. You'll need to import your knowledge base from the main URL. What happens if I import articles with unsupported formatting? If there are any issues with importing your content, we'll add a ‘Review’ label to the article so you can correct it before setting it live. Just open the article you need to review and read the recommendation that we’ve added. The recommendation acts as a placeholder so you’ll need to delete this and insert the content we recommend before you set the article live. Now that you’ve imported your articles, you should go ahead and customize your Help Center to suit your brand.